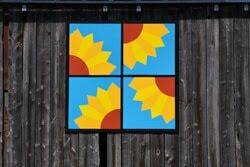 A Barn Quilt is a large piece of wood that is painted to look like a single quilt block. 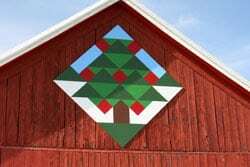 The quilt blocks or squares are painted on large wooden squares and then mounted on a barn. The size of the squares vary, but usually measure 8 ft. The painted squares are hung on the exterior of a barn. Just as fabric quilts have their own unique history, so do barn quilts. The earliest version of barn quilts have been around since barns have been around really. Way back when, barns weren’t always painted but were usually decorated in some from of folk art. This included quilt blocks. The pattern for a particular barn quilt may be chosen for various reasons. Often the barn quilt is a replica of a quilt that resides on the property, a family heirloom, or honors a loved one, a grand-parent or deceased loved one. A pattern may be selected because of the name of the farm or for what is grown or raised on the farm. Such as: corn, beans, apples, chickens, eggs, milk, Christmas trees and so on. Sometimes the barn quilt is simply a pattern that is appealing to the owner. In early 2000, barn quilts started to reappear. Everywhere you travel, you will see a colorful barn quilt in Shawano County. 250 brightly colored barn quilts are “blanketing” over barns located throughout Shawano County. 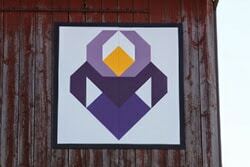 As of Feb.7, 2014 Shawano County Barn Quilt Project Reached a Milestone. Shawano County’s record-breaking barn quilt project had achieved a milestone with its 250th barn quilt put on display. The 250th Quilt is called “County Fair.” This colorful quilt is on display on the Coliseum building at the Shawano County Fair Grounds. This year the Shawano County Fair will be in it’s 133rd year. It will be held over Labor Day Weekend, from August 27-Sept. 1. The Shawano County Fair has: midway thrills, a tractor pull, demolition derby, free grandstand entertainment, polka bands, great food, craft exhibits, stock car races and 4-H exhibits. For more information on the Shawano Country Fair go to: Shawano County Fair. A Wisconsin Tradition and Served at all County Fairs throughout Wisconsin. 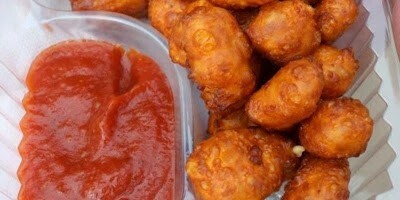 Deep Fried Battered Cheese Curds. Served with Ketchup. 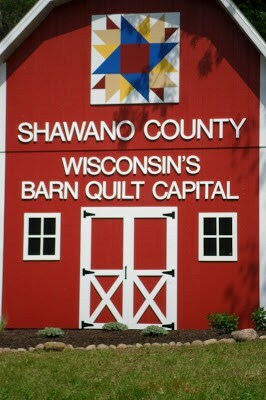 To learn more about Barn Quilts in the Shawano Area, Check out Shawano Country. While you’re there, make sure to tap on, “click here for more information on this quilt” It’s very interesting to read about the history, families and stories behind each barn quilt. There are truly many fascinating, hard-working and dedicated people living on Wisconsin farms. The barn quilts are absolutely beautiful and I'm sure they took a lot of time to complete! They are a part of American Culture that we often forget. I LOVE that… so much is too quickly forgotten. Thank you for sharing these. I love seeing this folk art and reading about the history. I've never heard of barn quilts. I went to the Barn Quilt website you mentioned and found that there are even some in Louisiana. I never knew! Good Morning Lynn, What a fascinating insight to barn quilts. When I read the title I thought the barn quilts were going to be hand quilted, so it was a lovely surprise to see they are painted quilts. They look so eye catching positioned on the barns and it would be lovely to take a drive to enjoy all the barn quilts on offer. Thank you for introducing me to a fascinating subject. Beautiful! This is Americana at its very best. Wish we had these in Michigan – I'm surprised that we don't since Michigan and Wisconsin have the same midwest values and culture. Maybe they'll catch on here sometime. I'd love to drive around to photograph them like you do!